Birmingham’s loss is a gain for Alcorn State. In a rematch of the 2014 SWAC title game, Alcorn looks to win its second championship in five seasons while Southern seeks its first since 2013. Roughly five months ago, a football championship game to decide the winner of the Southwestern Athletic Conference (SWAC) was out of the question as the conference decided to do away with the game in June 2017. However, on the eve of the conference media day in July, the SWAC announced the return of the title game and its location – historic Legion Field – the site where the game was played from 1999 to 2012. When SWAC commissioner Charles McClelland announced that the 2018 Toyota SWAC Championship game would not be played at Legion Field and instead played at the home stadium of the team with the highest ranking, Alcorn State was coming off a 27-13 win over Prairie View, sitting atop the SWAC East division. As for Southern, the Jaguars had just defeated Jackson State 41-7 a couple days prior to the announcement. With the Jaguars and the Braves sitting atop their respective divisions, both teams controlled their own destinies in terms of making a SWAC title appearance as long as they won out through the remainder of the season. And as added motivation from the conference about the changes to the title game site, a chance to not only play for a championship and host it was the perfect catalyst to keep things interesting down the stretch of the season. But, one important factor had already taken place roughly a month before the SWAC made its announcement. Alcorn defeated Southern 20-3 on Sept. 29 and if both teams won out for the remainder of the season, the Braves would host the conference championship game. That brings us to the first weekend of December, the weekend of the SWAC Championship. 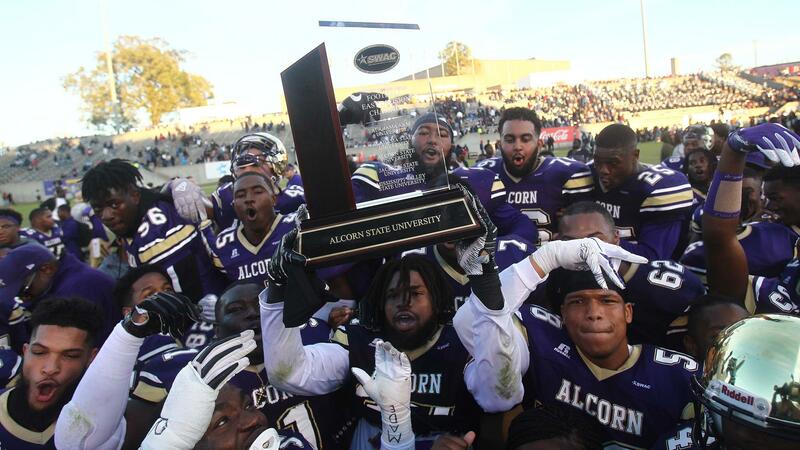 A championship game that finds both Alcorn and Southern back again as the two teams faced each other in the conference title in 2014 with Alcorn getting the best of Southern, winning 38-24. But for Jaguars sixth-year head coach Dawson Odums, his team is ready for the challenge, considering Southern is coming off a 38-28 win over Grambling State in the 45th Bayou Classic after losing to GSU the last three consecutive seasons and dealing with some of the challenges the program has overcome in recent years. “It is hard to get to a championship at any level,” Odums said in the SWAC media teleconference call Wednesday morning. After going 2-3 against quality opponents through the first five weeks of the season, Southern (7-3, 6-1) enters Saturday’s game having won their last five games since losing to Alcorn in September. Their first five opponents included TCU (6-6), Louisiana Tech (7-5), Langston (9-2), Alabama A&M (6-5) and Alcorn (8-3). “The opponents in our first five games did not have a losing record,” Odums said. Following the loss to the Braves, the Jaguars had a bye week and have been a different team ever since. “Coming out of a bye week, we are 11-2,” Odums said. The Jaguars sit fourth in the conference in scoring offense (28.3 points per game), sixth in total offense (373.9 yards per game), second in rush offense (207.7 ypg) and seventh in pass offense (166.2 ypg). But against Alcorn, the Jaguars were not having this much success on offense, mainly due to the players who were playing then – those who played from the previous season and rightfully earned their spot to play – but failed to get the job done. “Changes” were made, with the biggest one being Jaguars making Ladarius Skelton the starting quarterback. Skelton, who had only one pass attempt against the Braves in the regular season matchup, was then the backup to then starting quarterback John Lampley, who finished that game throwing 9-of-26 for 59 yards and one interception. Since taking over as the starter, Skelton has thrown for 803 yards and rushed for 465 yards (second in rushing for SU) and five touchdowns, averaging 5.9 yards per carry and 51.7 rushing yards per game. Even more, in the victory against Grambling, the Pine Bluff, Arkansas native threw for 217 yards and three touchdowns and ran for 79 of the Jaguars 247 total rushing yards. Thus, Braves third-year head coach Fred McNair knows the team his players will face on Saturday will not be the same one from the September matchup. “They’ve gotten better since the first time we played them,” McNair said. A majority of the Jaguars’ offense comes on the ground behind the play of Skelton and others in their rushing attack that includes quarterback John Lampley, running backs Devon Benn (leads the team in rushing with 728 yards), Carlos Stephens, Darbbeo Proffit, Jamrqueza Mims and wide receivers Christopher Chaney and Kendall Catalon. And while Skelton’s biggest asset has been his playmaking ability with his legs, he has proven that he can throw the ball down the field to his receivers, something that Alcorn’s defense will look to make him do more of. “He (Skelton) understands that good teams will stop the run and that should open up some opportunities for us to throw the football,” Odums said. Catalon, who ranks 12th in the conference in receiving yards, also leads SU in receptions and receiving yards with 31 for 406 yards and five touchdowns. Behind him, Trey Smith has caught 21 passes for 361 yards and seven touchdowns. Then, wide receivers Randall Menard and Cameron Mackey have combined for 340 yards and four touchdowns. “I think he’s (Skelton) ready to step up and make plays,” Odums said. Southern’s fate remains to be seen and Alcorn’s defense will be put to the test again but this time Skelton will be its main priority. Defensively, the Braves are stout, sitting at first in scoring defense (allowing 20.6 ppg), first in total defense (allowing 283.4 ypg), first in rush defense (93.2 ypg), fourth in pass defense (190.2 ypg) and second in defensive efficiency. Even more, Alcorn is first in total sacks earned (45), first in limiting opponents first downs (allowing 15.9 per game) and second in third-down defense. Braves defensive lineman Sterling Shippy said the team’s preparation played a big factor in Alcorn’s ability to earn the victory in the season. “It all started Monday with preparation,” Shippy said. Alcorn (8-3, 7-1) enters the game coming off a bye week and will look to get its offense going very early. The Braves are led by redshirt junior quarterback Noah Johnson, who is no stranger to the big moment and has made a huge impact this season for Alcorn as a dual threat at his position. Johnson – who ranks second in total offense in the SWAC— leads an offensive unit is that second in scoring offense (33.2 ppg), first in total offense (471.3 ypg), first in rush offense (274.3 ypg), sixth in pass offense (197) and first in offensive efficiency. The success of the Braves’ offense is predicated on the run first, which leads to Johnson being able to make passes down the field. Coach McNair credits the play of his offensive line that has allowed his team to be successful offensively. “Coach Stanchek has been doing a great job with the offensive line and getting those guys on the same page and getting them to do things the way they should be – opening holes for running backs and that type of thing,” McNair said. Johnson has had quite a season. The Tampa, Florida native has thrown for 1,944 yards, 15 touchdowns, and eight interceptions and recorded the highest quarterback efficiency rating in the conference (137.7). On top of that, he is the second leading rusher on the team and fifth in the SWAC, running for 813 yards, seven touchdowns and averaging 7.1 yards per carry and nearly 74 per game. For Odums, he knows that Johnson is the key to the Braves outstanding offense and how important his presence means in the championship game on Saturday. “He’s been there in the championship game and he ‘s done a good job as the team leader,” Odums said. Odums also credited the level of talent surrounding Johnson. “They got some people around him that can take a lot of pressure off of him,” Odums said. Those players come in both the running game and receiving core for the Braves. Running back De’Shawn Waller, who ranks second in the SWAC in rushing, leads Alcorn in rushing yards with 871 and nine touchdowns, averaging 5.7 yards per carry and 108.9 per game. After Waller, P.J. Simmons has rushed for 712 yards while Marquise Forman has tallied 281 yards and two touchdowns as the next biggest threats on the ground. At wide receiver, Raidarious Anderson, Chris Blair and Dayall Harris have been Johnson’s favorite targets this season. Blair leads the team in receiving yards (487) and touchdowns (6), averaging 12.8 yards per catch and 44.3 ypg. Anderson has snagged 28 catches for 459 yards and three touchdowns while Harris has compiled 22 catches for 391 yards and four touchdowns. “Coach McNair has done a great job,” Odums said. Like the Braves’ defense, Southern’s defense has made its mark in 2018. The Jaguars rank third in the SWAC in scoring defense (24 ppg), third in total defense (358 ypg), second in rush defense (136.9 ypg) and seventh in pass defense (221.1 ypg). The Jaguars are also fourth in defensive efficiency, third in limiting their opponents’ first downs (20.2 per game) and third in third-down defense. Johnson, who had his worse passing outing against Southern despite the victory, said he is confident in his abilities going into the game. “Their front seven is really good, great defense overall but we come out and play our game, we will be fine,” Johnson said. But for Odums and his defense, those numbers will be put to the test in stopping Johnson and company again. “It’s going to be tough,” Odums said. Since 2008, the Braves have won six of the last 11 against the Jaguars, including the last two regular-season matchups and the 2014 SWAC title victory against SU. As for Southern, the Jaguars plan for it to be a new day on the horizon and a new champion will rise on “The Reservation” Saturday afternoon. In a game that will feature a hostile environment and home-field advantage for the Braves, Odums said he is not worried about those factors. “I know Jaguar Nation will be represented and it is going to be a good one,” Odums said. Kickoff is set for 3:33 from Jack Spinks-Marino Casem Stadium.